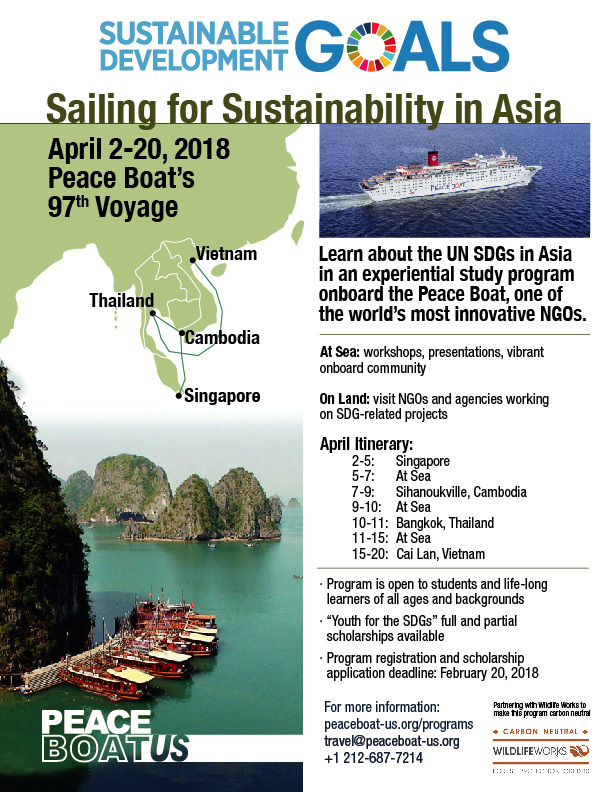 Travel in Southeast Asia with the Peace Boat and learn about the UN SDGs in an experiential study program “Sailing for Sustainability in Asia”, taking place April 2-20, 2018 during Peace Boat’s 97th Voyage, visiting Singapore, Cambodia, Thailand, and Vietnam. In 2015, 193 UN member states came together to define 17 Sustainable Development Goals (SDGs) to shape the global agenda for sustainable development in the next fifteen years and beyond. Peace Boat has made promoting and advancing the UN SDGs a key part of its mission. This program is for students, activists, and lifelong learners of all ages, backgrounds, and nationalities who are currently or previously involved in SDG-related activities or have a strong desire to learn about sustainable development. Achieving the SDGs requires mobilization of young people through entrepreneurship, volunteering, research, education and other endeavors. 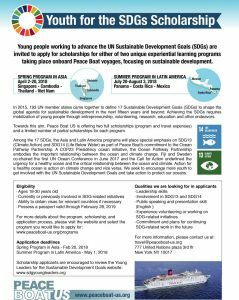 Toward this aim, Peace Boat US is providing two full scholarships (program fee and travel expenses) and a limited number of partial scholarships each, for this program and our Summer 2018 Latin America SDGs program, under the “Youth for the SDGs” theme. Please see below for application criteria and qualities we are looking for in applicants. Sailing onboard Peace Boat, you’ll attend presentations, seminars, and workshops addressing the SDGs. You’ll also enjoy being immersed in the onboard community with many opportunities to participate in other cultural, educational, and social activities and events. In ports, you’ll visit local NGOs and others who are working directly on SDG issues related to climate change, youth engagement, and policy-making. Peace Boat US is partnering with Wildlife Works to make our programs carbon neutral. Upon initial registration, we will send further details about completing the voyage registration, documents for submission, and payment processes. Short-listed scholarship applicants will be contacted individually to schedule an interview process. Experience volunteering or working on SDG-related initiatives, with particular emphasis on SDG13 (Climate Action) and SDG14 (Life Below Water), as part of Peace Boat’s commitment to the Ocean Pathway Partnership, a COP23 initiative recognizing the critical relationship between climate and the ocean, and reflecting the.Call for Action from the first UN Ocean Conference in 2017.